What happens when you bring amazing kids,former baseball stars, a beauty queen and a dedicated popular businessman together? Extravagant dinner decor and name tags given from “home field” were the talk of the event! A great event folks! Plain and simple. “This is the hottest ticket tonight and I am glad I got to come. Models, sports legends and incredible people like Howard Lutnick who care about kids, what else do you want?” said a gorgeous, tall brunette wearing Vera Wang and enough bling to buy a team. 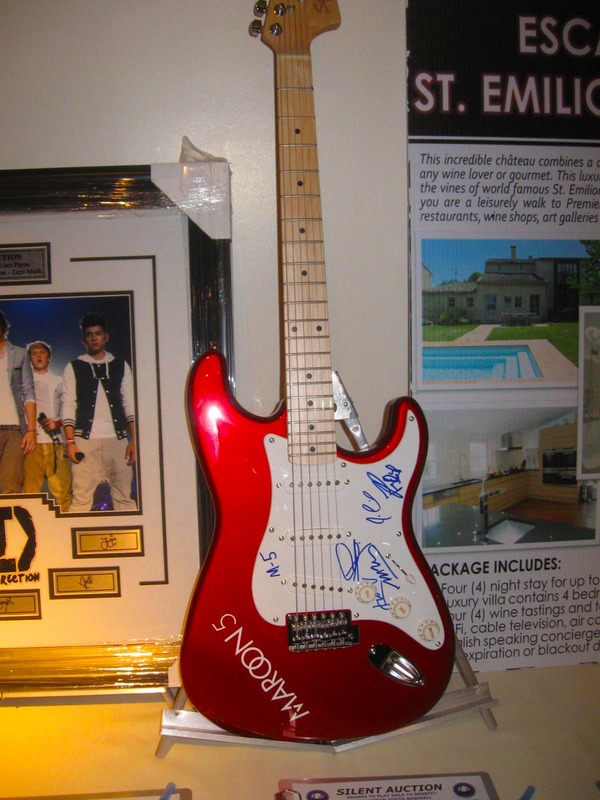 The Maroons signed guitar was a hot item at the auction. At the recent Manhattan Youth Baseball Grades to Play gala dinner event held at The Lighthouse at Chelsea Piers in NYC, sports icons, gorgeous models and some of the most beautiful (and wealthy) personalities and socialites from Manhattan came together to honor the popular and dedicated businessman Howard Lutnick, President and CEO Cantor Fitzgerald for his dedication to helping inner city kids and families with support and mentorship. I’ve met Lutnick before and he is in fact one of the nicest businessmen I have ever met and the honor was indeed very well deserved. 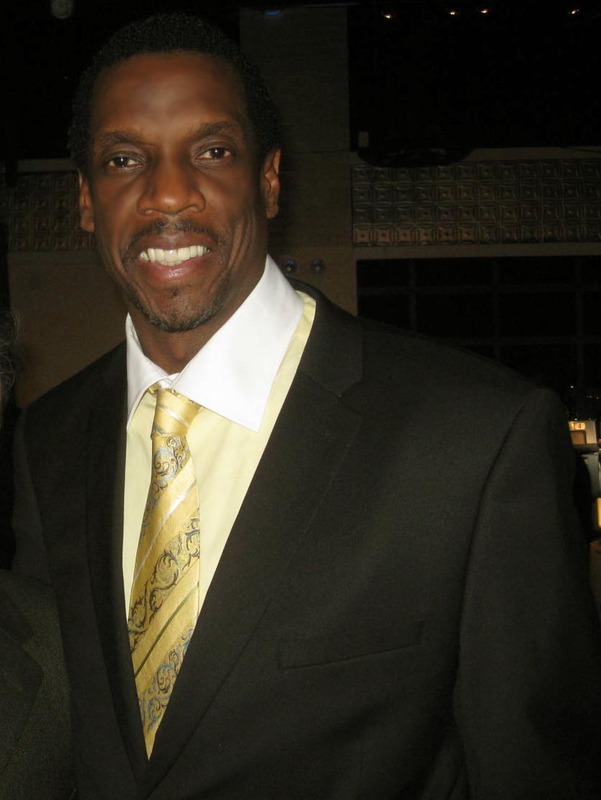 Yankee great and superstar Dwight “Doc” Gooden was one of the special guests who has been a long time supporter of inner city kids since his playing days with the Yankees and has never forgotten his roots. “It’s a dream come true for me to meet such a big baseball superstar,” gushed an adorable little kid waiting in line to get a baseball signed by Gooden. RR: Dwight, indeed a pleasure to meet you. You have had many ups and downs in both your professional and personal life but you have always been able to over come your adversaries. How did you manage it? DW: It’s been hard. I have been very lucky in that I have had an immensely support system in my life both on and off the field. Family, friends, coaches and teammates have helped me when I needed someone. I am trying to help the youth and I grew up in inner cities so I can relate to them. I had the support of my coaches and parents which helped me a great deal. These kids are talented but they sometimes need someone to push them like I had. I was very fortunate to have that kind of support system. RR: When you walked into the room, these children’s faces just lite up as they rushed to meet you. How did that make you feel? DG: I have truly been lucky and blessed to have had such a successful career and to be appreciated for it. Anytime you can mentor kids, give them the opportunity to fulfil their dreams, it’s worth it. You also develop friendships that last a lifetime and you learn so much about life when you get a mentor that cares such as how to be accountable for one another and share goals and dreams with each other. Having someone to support you is so important especially at a young age. RR:How have you dealt with your own personal struggles both in your career and personal life? DG:My problem has always been that I tried to get through my own personal inner struggles alone instead of reaching out to my friends, families and close support group. But now everything is good and I can’t let my guard down. Honestly, it’s sort of therapy for myself talking to children. RR: How has the journey been like so far for the Doc? DG: A great one. I played professional baseball for the top team…I lived the dream..now it’s time for these kids to live theirs. From “The Boss” to The Yankee Greats, it was all there at the auction! Part of the special evening was a silent auction that included sports and musical memorabilia donated from superstars including Bruce Springsteen, Walt Frazier and The Maroons. 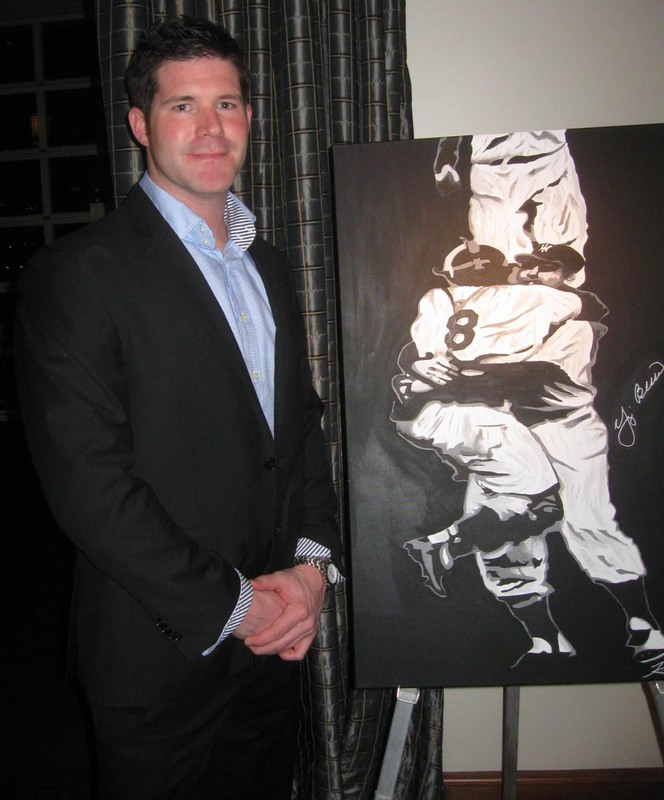 Part of the silent auction were captivating pieces of artwork donated by a young, extremely talented former Yankees baseball player Kevin Rival who has created some of the most artistic treasures you will ever see. RR: Kevin, it’s great to meet you. Your artwork is well liked by the children. Have you always had such a strong connection with them? KR: Thank you. I have always worked with children. 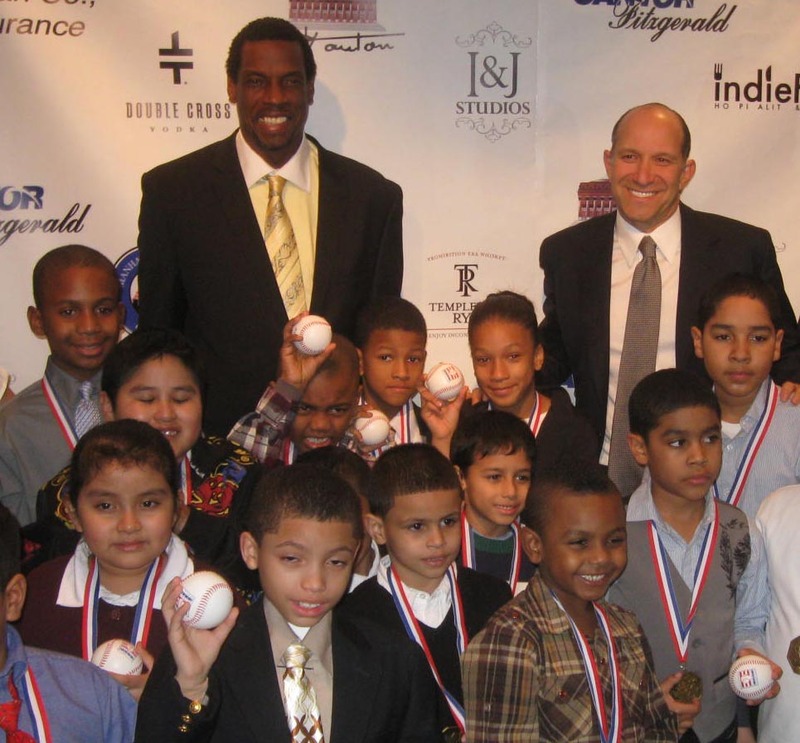 After professional sports, I ran a baseball camp for children and have always been involved in helping them in sports. RR: Was the transition from professional baseball to artistic creativity a difficult one? baseball players so it was a nice connection with kids that I was able to make through sports. Now with art, kids also love art and I am lucky enough to do art well enough so that it sells well and I can make a living at it. Miss Dominican Republic US 2013 Chantel Martinez spoke to the Ravi Report about her personal involvement with the baseball organization. RR: Chantel, such a pleasure meeting you. Congrats on the title. I hear you are a big fan of baseball. True? CM: I love it! I have been playing baseball since I was a kid. Also, now when I am not touring or speaking at events, I throw off the crown and put on a hat and play some ball! LOL! RR: Do you consider yourself a role model for these kids? if you have some positive influences in your life through people or sports, you will go far. It’s a win-win situation. For more information regarding the organization, go to http://www.manhattanyouthbaseball.com.